Oh, how I loved reading this book. I mean, I knew I would love it, since I loved book one so much, but I was still nervous. But yeah. I shouldn't have been. Because this book was amazing. But it broke my heart even more than The Map to Everywhere. Which is just way too mean. Hmph. But I loved it so much. I had hoped to get an ARC of this book so badly. Yet I never did. But then it was up on Netgalley a little while ago, and I had to request it. And yesterday my request was approved. I was thrilled. And started re-reading book one right away. Which was so perfect. Sigh. But I was also a bit unsure, since Carrie told me they changed things from the ARC to the finished copy. But still. I couldn't not read it right away, not when I finally had it. But I need to know the changes. So will be looking through it all once my precious hardcover arrive. But anyway. I read this eARC. And I don't think anything was wrong with it. This story is incredible. The characters are amazing. And the writing is gorgeous. So thrilled that I loved this book. 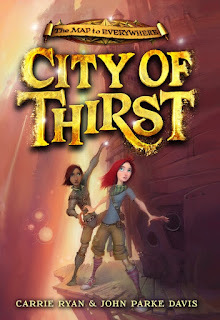 I don't know where to begin when it comes to the plot in City of Thirst. It is just amazing. This book takes place about six months after the end of The Map to Everywhere. Six months since Marrill left Fin and went back to her own world. I do still love Marrill a lot. She's pretty awesome and fierce. And my heart breaks for her about her mom being sick. Sniffs. Marrill must also have a babysitter now; Remy. I thought she would be annoying, but she really wasn't. I adored reading about her too. She was awesome. But my most favorite character is still Fin. Whom is just the most adorable boy. And thief. And my heart is aching for him. Marrill was the only one who remembered him. Then she left. And Ardent and Coll still don't remember him, and it is so sad for him, and oh. My heart hurts. I just want Fin to be loved. To be remembered. And it is all he wants too. But he can't have it. And it huuurts. Yet it is so perfect. So evil. So great to read about. But even though Fin is hurting, he still isn't breaking apart. He's the strongest. I don't even know what to say about the plot. There are lots of new places. And they are awesome. And creepy. And so much fun to read about. I loved them all. And so many characters. They were all very interesting to read about and I loved getting to know them all more. I just wish they all knew about Fin. About how amazing he is. Biggest wish is for people to start to remember Fin. And then remember all the times they have seen him in the past. I do need that from Ardent and Coll. Sigh. Fingers crossed. There is so much happening in this book. I loved it all. But this one thing broke my heart the most. I'm not sure I should even mention it. But I have to. I must. Marrill starts to forget about Fin. And gosh. It hurt me the most. Because now no one remembers Fin. And it hurts him so badly. And it hurts me even more. I just can't. It wasn't fair. Fin deserves better. A better friend. He deserves to be remembered. And I need to read about that. I need to. My heart needs some hope. Sigh. I think it will come. It must. I'm not going to say more than this. But yeah. I really liked this book. And I thought the ending was pretty perfect. Fin is just so selfless, and I adore that about him. Like I love everything about him. Sigh. Also, I do think Fin and Marrill could end up as a very cute couple. Which I am hoping for, hih. 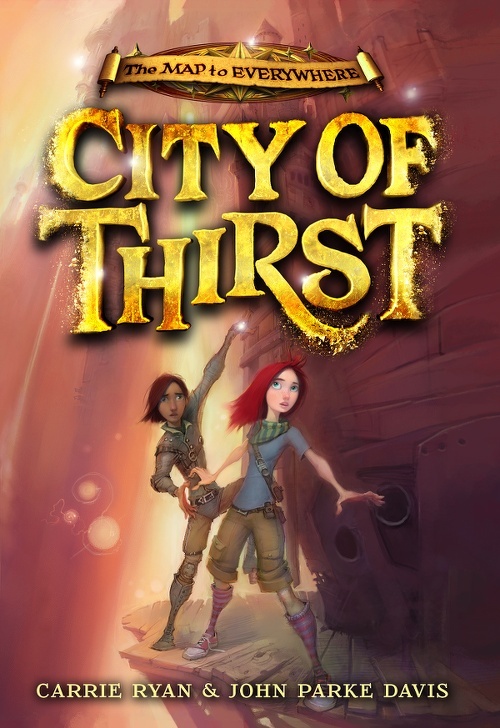 City of Thirst was a perfect sequel. Full of adventure and fun. It was always exciting. And so heartbreaking. I always wanted to know what would happen next. I seriously could not have loved this sequel any more. This series is perfection so far. But waiting for the next books is going to be torture for me. I want to know what happens next right now. I need to know. Sigh. I just really wish to read them right away, hih. But I do know that the waiting will be worth it. But ugh, I hate waiting. Anyway. So excited for the next book in this series :D It's going to be amazing. And even better than this one, I'm sure of it. If you have read book one, then read this sequel too. These books are so worth reading. They are simply fantastic. The cover is so you! Lol.